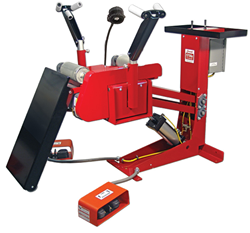 Branick Industries, globally known as a leader in tire service and inflation equipment, announces the Model 5700 Adjustable Height Tire Inspection Spreader. The Model 5700 is designed from the ground up to be the best tire inspection and repair spreader available with all the quality, durability and exceptional working life Branick is known for. Branick will debut the spreader at SEMA (booth 42193) before its January 1, 2018 release. The Model 5700 is American made from American steel. It has an auto extending and retracting ramp to simplify tire loading. The hand operated spread arms have a triple bead holding system that keeps tires solidly in place on the zinc plated rollers. The rollers are electrically powered with hand controlled variable speed and foot operated rotation direction. The tire platform handles truck tires up to 445-50 series, and the tire platform doubles as a lift to minimize the space required. Functionality and ergonomics were designed in so the Model 5700 also has an attached tool tray so tools are always where you need them and the RMA compliant gooseneck LED light provides excellent visibility for inspection. The tire platform is adjustable from 15”- 32” so everyone gets the right working height, reducing back strain. “Branick’s founder, Earl Branick, created the first tire spreader and Branick has been the leader in tire spreaders ever since,” said Tom Bolgrean, president of Branick. “The Model 5700 carries that tradition forward. We feel this is the best repair and inspection spreader on the market,” Bolgrean said. To learn more about the Model 5700 or any other Branick product call 800.437.4394 or visit http://www.branick.com. Branick was founded 100 years ago with the introduction of the tire spreader, invented by Earl Branick. Since then, Branick has been an industry leader in tire service and tire inflation equipment, nitrogen systems and retread equipment. Branick holds the number one position for numerous products including strut compressors, brake bleeders, and nitrogen inflation systems. With over 1,000,000 customers worldwide, Branick proudly remains focused on the tradition of quality instilled by Mr. Branick, while the team of R&D engineers continues his legacy of innovation. With manufacturing locations in the USA Heartland, Branick Industries is committed to maintaining the well-earned reputation for quality, service, innovation, and value.